I was in the Hyde Park Family History Centre in London yesterday doing some research, and went for a walk to stretch my legs. 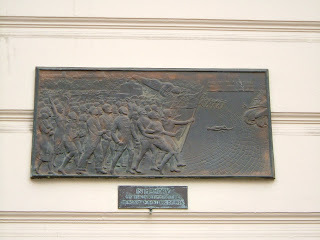 a plaque to the 1956 Hungarian Uprising in the wall of 55 Exhibition Road, just opposite Imperial College. After a lot of digging I’ve discovered that it was sculpted by Frank Kovacs and was unveiled by Lord Birdwood on 13 March 1960 when the building was a Polish Club. The building still houses a Polish club and restaurant but why the Polish club… anyone know?